It seems I do this at least once a year, but I have a floppy bamboo that I need to take care of. 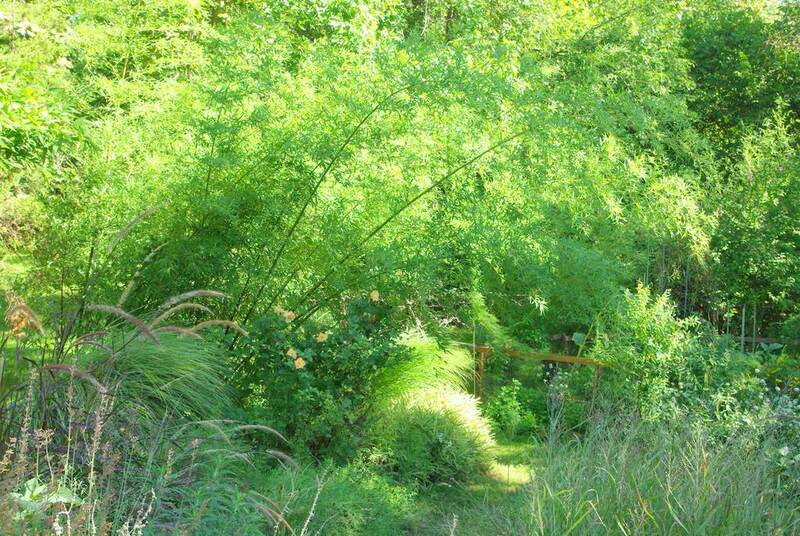 This time it's black bamboo, Phyllostachys nigra. 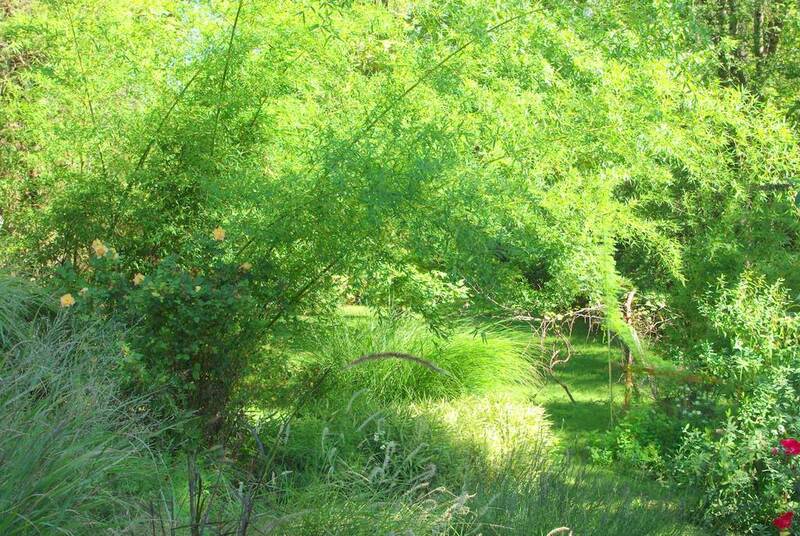 One of the attributes of this bamboo is its gracefully arching culms, but this is too much. 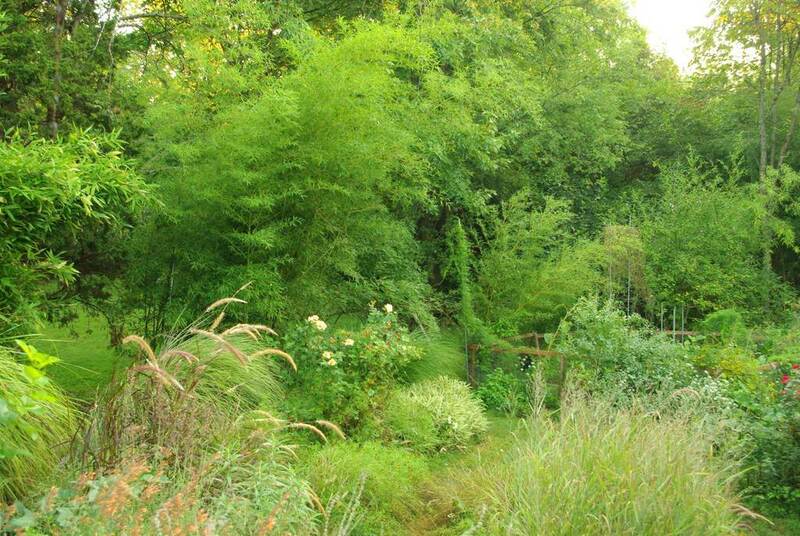 It's not appropriate for this spot, as the drooping culms shade out too many plants and block access -- especially after it rains and the culms bend almost to the ground. Kinda cool, but not practical. I've got some poles in there for support, but I'm not utilizing them well. I don't see how they'll support those surprisingly thick and heavy culms anyway -- this plant really sized up for me after our mild winter. 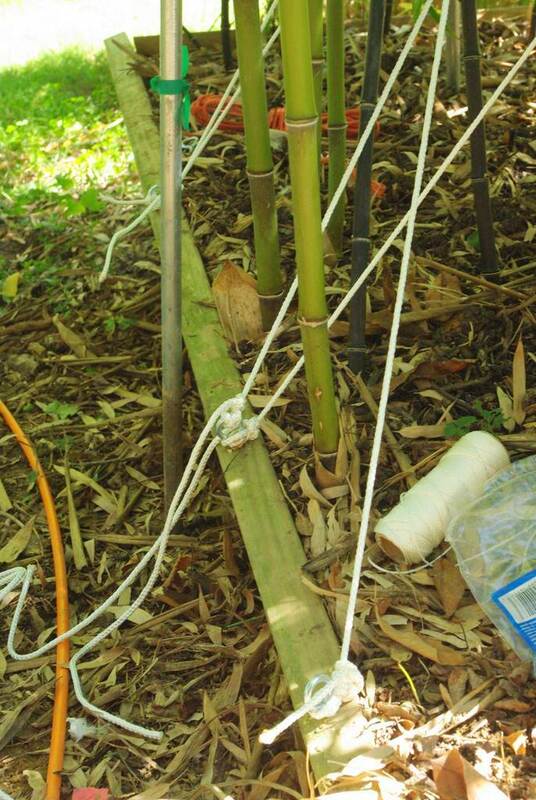 As I was looking into the back side of the plant trying to figure out the best support pole configuration, I realized something: why not utilize the wooden "box" that's here? I had to take a trip to buy some appropriate rope as what I had already was not strong enough, and an assistant would have been nice to take the weight off the lines as I tied them, but it was a pretty simple solution. How about a before and after for easy comparison? The big-leaved foreground plant is a butternut squash volunteer that I'm using purely as ornamental. 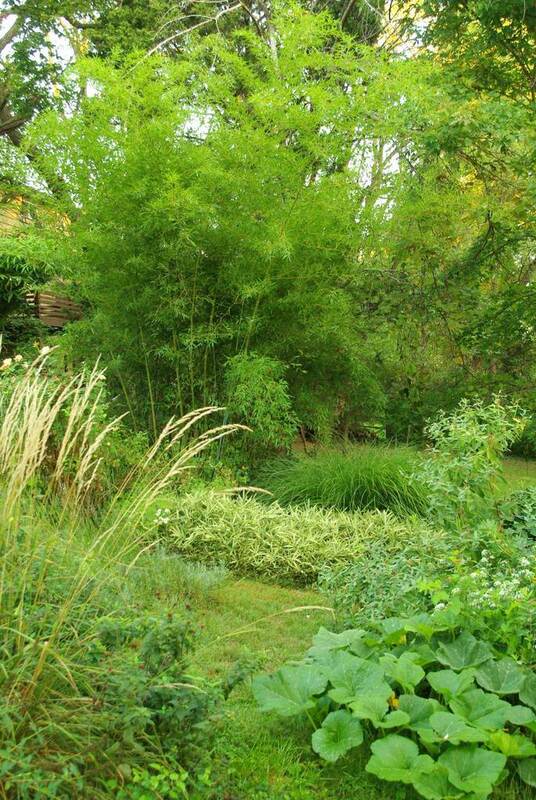 It adds so much to this part of the garden, and I never would have thought to plant one here purposefully. I will from now on though! Once this bamboo adds more culms this tie-each-culm-up-individually method won't be practical, so I'll probably need to do something else next year too. 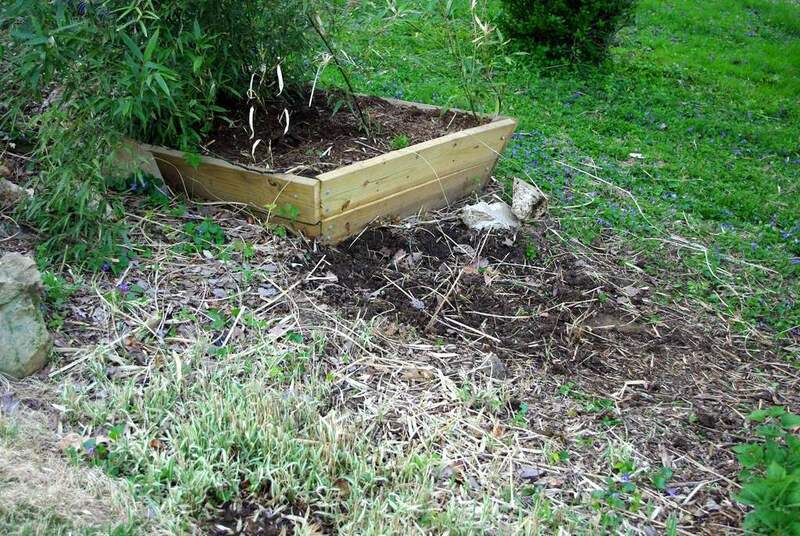 It's possible that with more culms the plant will start self-supporting, but we'll see. 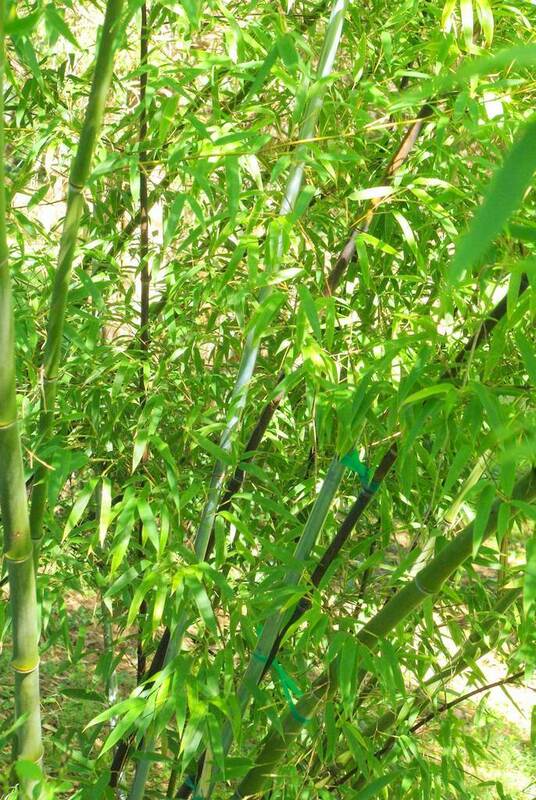 I've got one other bamboo that has an arching habit like this, and I'm tired of dealing with it. I'll be removing it sometime in the next few weeks and replacing it with a more upright species. 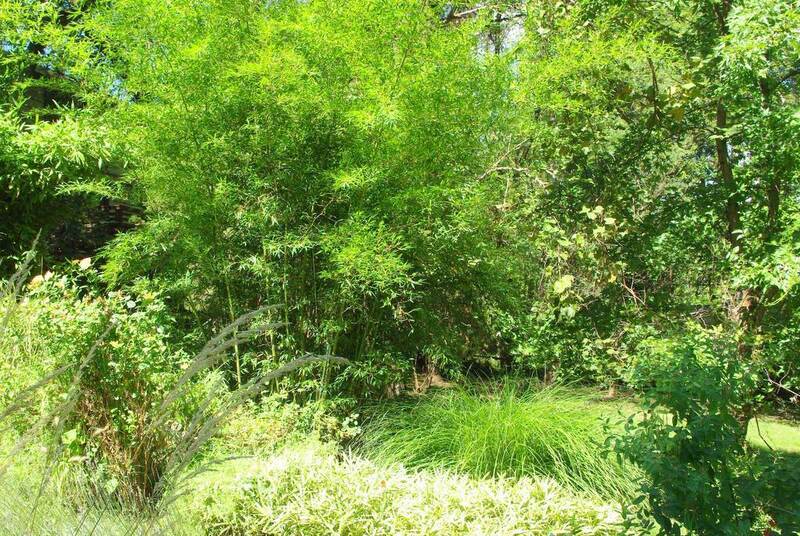 For this black bamboo though removal is not an option (at this time). It's just too nice, and the black culms are incredible! So I'll deal with floppiness when I need to. I wish you made house-calls. Earlier this spring I realized our Sasa palmata (in a stock tank) was practically horizontal, leaning out over the patio and taking up valuable real estate as well as shading out things growing in front of the tank. We pulled it back and tied it up, but it looks horrible. I'm considering a sort of complete overhaul at some point but for now have just been trying to ignore it. What an incredible difference, when it rains here the bamboos groan under the weight of water this would be a great solution. It looks pretty nice. 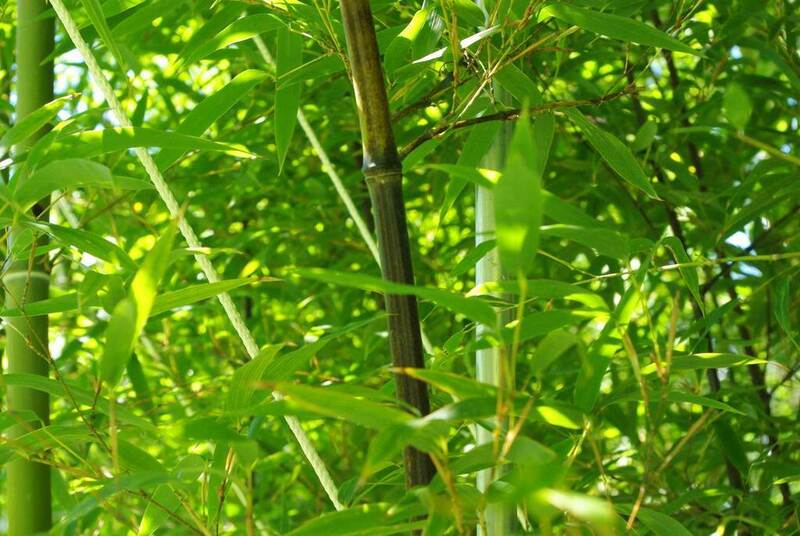 I think one way to prevent the arching habit altogether is to tie down the older culms in the spring during shooting season so that the new ones can manage to grow upright, and I think more leaf surface exposure also means more energy for the new shoots. I did it with parvifolia which is notorious for floppy culms, and it is still very upright up until today, but I plan on tieing those apart again next spring so the new shoots can once again have space to grow straightly. 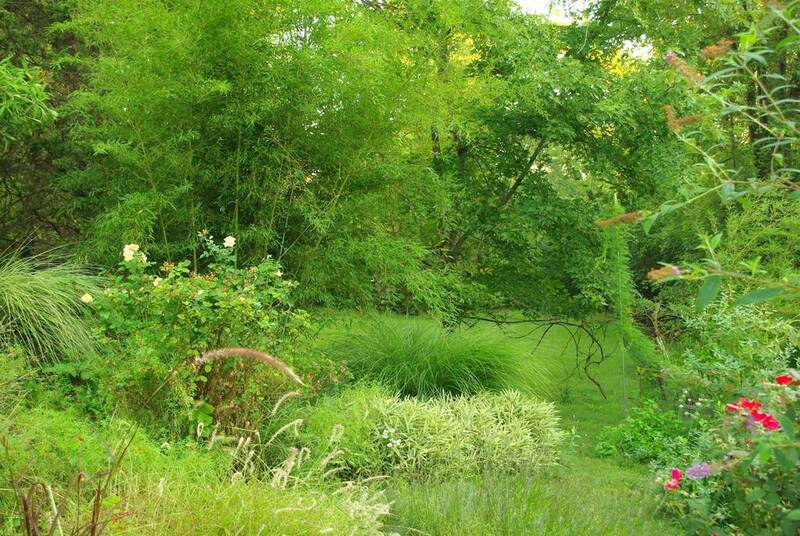 Its beautiful, everything in your garden is so lush and green. Stunning!